I love seeing your pages and how they are filled with so many wonderful layers Kate. Darling photo of your children. Such a poignant insight regarding aging and your grandmother. I think so long as you have those precious memories they can still bring a bit of youth to the spirit. Happy T day! Today I’m not sure which I like better, the lovely journal pages you have created for your daughter, or the memories you are conjuring up as you shared this post. Wonderful thoughts of your aging grandmother and fond memories from your days in high school seem to blend perfectly with the layers of love you have added to the pages of the journal. 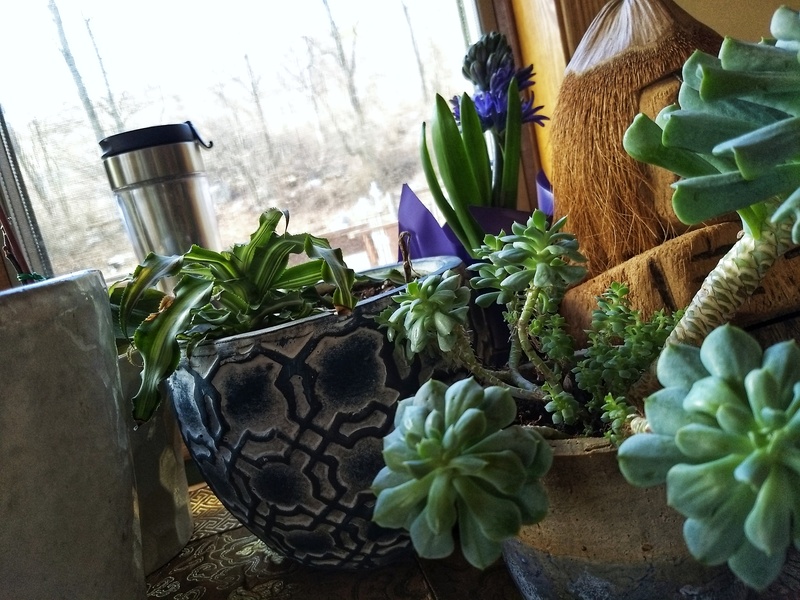 Your succulents are doing excellent for the horrible winter we’ve had. You certainly have a green thumb to go with that green tea you are drinking. Thanks for sharing your tea and your journal pages with us for T this Tuesday. Beautiful spread and great photo of your three blessings, Kate. 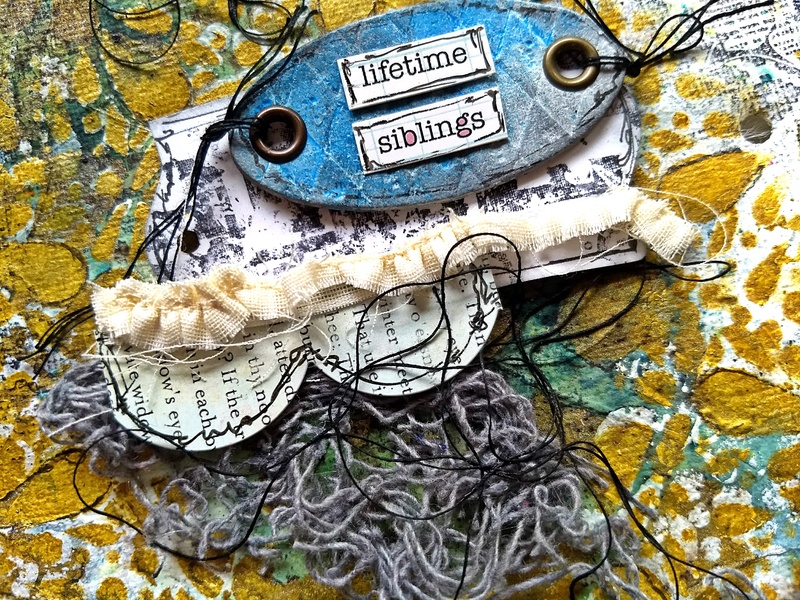 not only are your art journal pages gorgeous, but your writing is so eloquent and toughing! love these pages, and so true about memories and aging. Happy T day! A really lovely post to read, thank you for sharing your memories. Age is not always a comfortable subject to talk about, but no matter how we may look as times passes, age is just a number, its how we feel and embrace our life that matters. 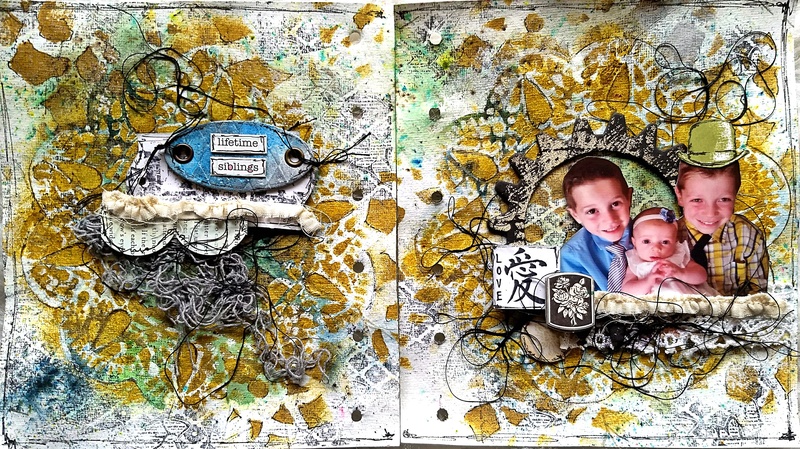 Your journal page looks fantastic, wonderful layers and a lovely family photo. When I was young 30 seemed so old. I was convinced I would be dead by the time 30 rolled around. ::-D I’m twice that and still here. Sometimes wondered how did that happen. Today, at the post office, I remembered how my Young One liked to skip the length of the strip mall from the post office to the bank. A sweet memory as you captured with the page of your adorable children. My dad had Alzheimer’s and I think his memories of when he was young were a comfort to him. He sometimes went through a wormhole where he was between 17 and 24. Towards the end, he didn’t remember us. I don’t think it bothered him so much as it bothered us. He seemed content in his own world. Kate you write beautifully and always make me stop and think.. I have had such a full wonderful life as i sit here at 50 and to not be able to pull up a memory would be devastating.. Raising my daughter who is now 30 and pregnant with her own daughter…3 years living in and exploring Germany with my husband… getting married in Copenhagen… living 20years in TX… moving to CA for 3 years.. the redwoods. the ocean.. 25th Anniversary… … It would be terrible to lose all that..
i´m not sure which i like better: your written thoughts or the fabulous journaling… the photo of your Little ones is Darling! may you be blessed to experience health and a clear mind into high Age! Wow, nice pages with your “babies”…a very special treasured memory page. A fabulous celebration of treasured memories, Thank you for sharing with us over at That’s Crafty. What a beautiful post Kate! And such a beautiful journal spread! Your babies are precious! I missed writing you last Friday, but I wanted to wish you a happy nurses day and thank you for your service!